Advanced Search is useful for searching using a keyword or keywords and then refining the search with the use of filters. File type - The File Type filter will filter the results down to only the particular file type you choose. 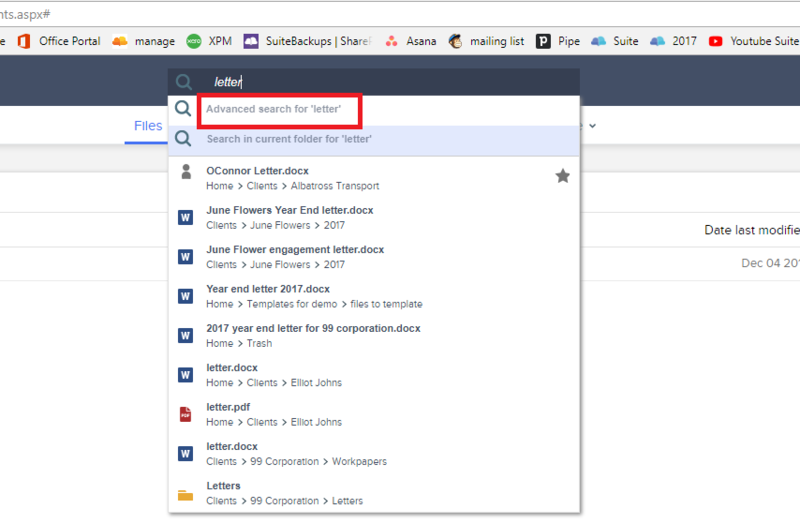 Client folder - The client folder filter allows to refine the search to only show results for items that are under a particular client folder. To recognise a folder as being a client the clients folders much be under the "Clients" folder under home. Financial Year - The Financial Year filter will filter down to the files which have a subfolder for a year e.g. "Clients\99 Corporation\2017\Workpapers\99 Corporation - March.docx" and if there's no subfolder for a year then it will filter the file based on the date the file was last modified. Modified by - This will filter the files based on the user the file was last modified by. last edited - This will filter the files based on the date the files were last modified / edited.